We're sorry, but this item is no longer for sale. 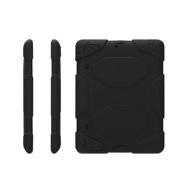 However, there may be more Apple iPad Accessories » Cases for Apple iPads » For iPad 2, 3, 4 » Protective Total Encasement items available. Ridiculously over-engineered? 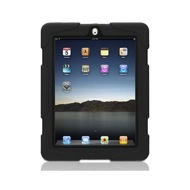 Or the perfect case for your iPad 2, iPad 3 & iPad 4 no matter where you're headed? Simply put, the Griffin Survivor Case is the most protective case Griffin built. 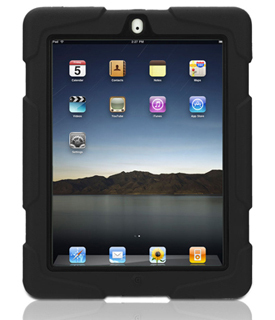 Tested and certified to meet or exceed US Department of Defense Standard 810F, Griffin's Survivor Military-Duty Case is designed from the inside out to protect your iPad 2 from extreme conditions ... dirt, sand, rain, shock, vibration and a host of other environmental factors. Survivor is independently tested and verified to meet or exceed environmental testing standards for blown rain, blown dust and grit, vibration, shock, temperature and humidity. Rating: 5/5 Good Product April 9, 2017 It makes holding an iPad easier. The texture of the resilient material aids in the grip. 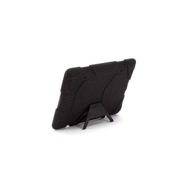 The triangle leg accessory does well to hold the iPad upright in the horizontal orientation though its thinness and general configuration does feel unsteady. The iPad feels well protected. Rating: 3/5 Solid, screen hard to read in full sun June 22, 2014 I use this a lot for my professional work outside. Had to remove the dark screen. Rating: 5/5 Worth the money and then some January 1, 2013 I love this case! Griffin Technology has rarely disappointed me with any of their products, but this one is really great. The assembly instructions could be a bit better, and if you're looking for light weight, this is not that. I chose this case because I tend to drop things from time to time, and this is definitely military grade. With all the ports sealed up, I would also say virtually waterproof. I liked this case so much that I just ordered a second one as a gift for a friend. I often use my iPad for reading ebooks, and after a while the aluminum edges would seem to cut into my hands. That problem is now eliminated. It looks tough and it definitely is!